Purpose of this web page: The pages linked to below trace the land transactions in the town of Durham, Androscoggin County, Maine, starting from the earliest property owners. How this page is organized: The first portion of this web page reports in chronological order the steps involved in the early land grants that lead to the 1766 Noyes Plan of Royalsborough. Bracketed material (e.g., [1:426]) refers to the book (1 in this example) and page(s) (426 in this example) of documents in the Cumberland and Androscoggin County Registries of Deeds. The second portion begins with an image of the Noyes Plan. Below the map is a table with basic information about each parcel. When deeds for a parcel are located, a link will be provided that will take you to a web page about that parcel. How you can help: Please e-mail scanned images or photocopies of deeds to info@vfthomas.com or send them by traditional mail to “Durham Deeds” at the address at the top of this page. James I granted a charter to Council of Plymouth. June 16 - Council of Plymouth granted a patent to Thomas Purchase and George Way. Land of Thomas Purchase and George Way sold to Richard Wharton. Richard Wharton died in England. November 5 - Wharton's land sold by administrator Ephraim Savage to Thomas Hutchinson, Adam Winthrop, John Watts, David Jeffries, Stephen Minot, Oliver Noyes, John Ruck, and John Wentworth, a group known as the Pejepscot Proprietors. April - Survey of Royalston made by Stephen Getchell, soon found to be defective. 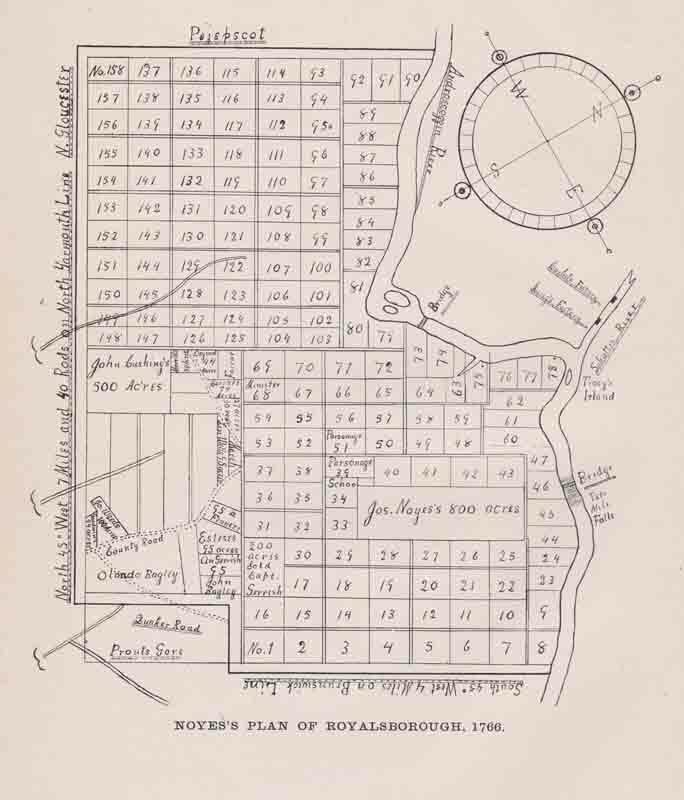 May 22 - Survey/plan made by Joseph Noyes. June 3 - 158 lots laid out, 96 for the proprietors and 621 for future sale to settlers. Land in addition to these 158 lots are shown on the plan below. All of these parcels are included in the table below the plan. November 23 - Plan made by John Brown, revising the Noyes plan. 13 100 acres one of the 62 lots to be sold to settlers 12 November 1770 sold to John Dean Jr.
31 100 acres one of the 62 lots to be sold to settlers 12 November 1770 sold to Charles Gerrish Jr.
1According to the data in the 1899 book History of Durham, Maine with Genealogical Notes by Everett S. Stackpole, more than 62 lots were sold to settlers, either originally or later under the “Betterment Act”. Research is needed to clarify this apparent discrepancy. 2According to the History of Durham, lot 58 was purchased by Jonathan Bagley on 10 June 1771 (page 7) and was purchased by Andrew Adams under the “Betterment Act” (p. 26). Research is needed to clarify this apparent discrepancy.